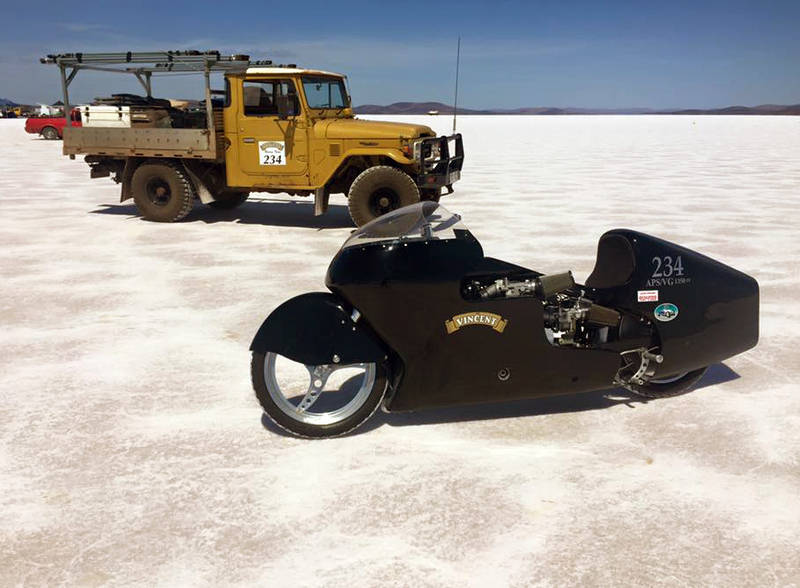 Lake Gairdner 2016: 185.340mph for Vincent and 193.061mph for Velocette! Mal Hewett sent me the following report from South Australia where the 2016 Speed Week just ended. 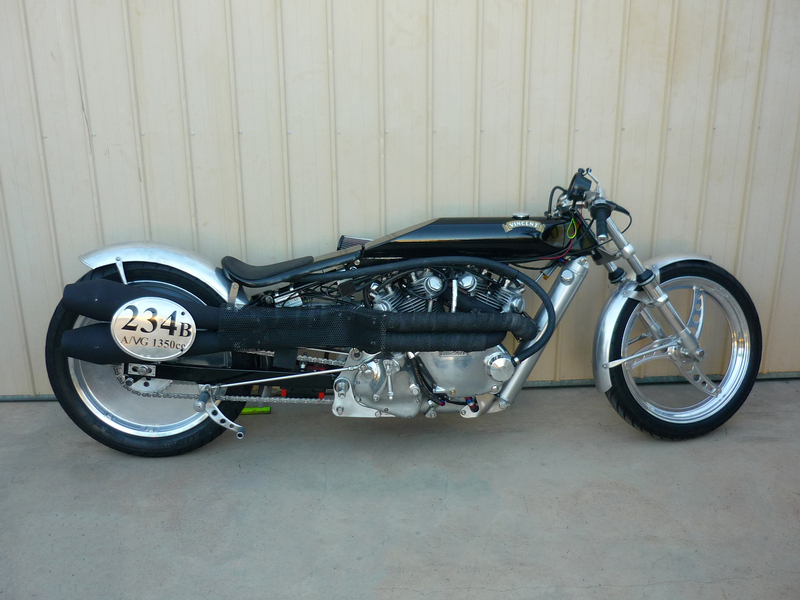 Running on gas, he achieved 185.34mph (298.27kph) on his natural aspirated 1300cc Vincent (APS-VG-1350 class). 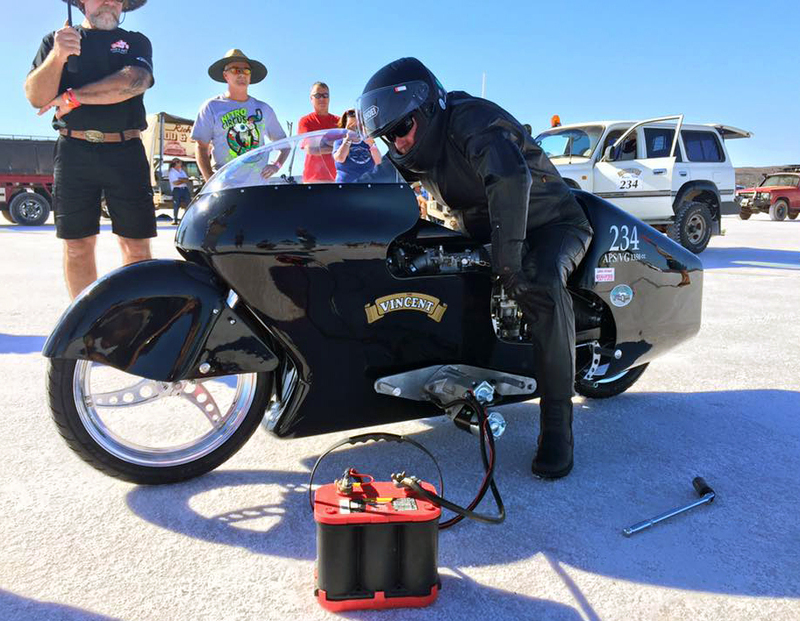 Congratulations as well to Stuart Hooper and his 650cc supercharged Velocette running on blended nitro-fuel (APS-PBF-650): 193.061mph (310.701kph) makes his Velo, one more time, the fastest single in the world. Note that both bikes were partially streamlined. I have just returned from the Dry Lake Racers Australia speed trials held down here in outback South Australia and what a week it’s been. After arrival at Lake Gairdner we were greeted with the news that the salt was dry and hard and possibly the best salt we have ever raced on! I have been racing at the lake since 2000 and even now when we crest the hill that allows you to see that gleaming white expanse of salt for the first time since the previous year, it still makes the hair on the back of my neck stand up. It is truly an amazing place and one of the best places on the planet to go fast! After running 166mph last year with the new frame and motor configuration I decided to concentrate on the fairing and some streamlining for 2016. I spent months fiberglassing, filling, sanding, and modifying the body, tail and front mudguard. I also had some motor problems to sort from 2015 so it was a steady year in the shed leading up to the event. Entrant Numbers were down this year so Monday morning we were in line early for our first shakedown run. After we were underway, it didn’t take long for a gust of wind to move me from one side of the track to the other at about the one mile mark. (Two mile run up to the first timing light) I tried to move my weight to the right to counteract being pushed to the left but it had no effect. I rolled off the throttle and straightened up going through the timed mile (Two to Three) at 166.945mph and 6000rpm. It was the first time I had ridden the bike with the new fairing in the partially streamlined class and it was a bit unnerving. After giving the bike its checks we realized we only had about 25lb in the front tyre so it was inflated to its normal 50lb. We decided to run as late in the day as possible as the heat was up around the 40ºC mark most of the afternoon. So at 17:38 we were on track again. This time the bike felt so much better and it give me confidence to open it up to 6500rpm. Our speed over the flying mile was 173.55mph. I was very happy with that. Pretty good for the first day. On Tuesday the wind was gusting down the track, quite strong at times so I decided to sit it out and wait for the morning which would have denser cooler air. It was a long day waiting around in the heavy heat, well above 42ºC. Friends had traveled from as far as Queensland to watch the Vincent run and I started to feel obligated to get out there but I stuck to my plan to wait it out and it paid off. The morning conditions were perfect! Cool with 2-3mph breeze straight down the track. Jetting was changed and we were blasting down the track about 8:30am. The bike just roared and revved clean to 7000 in top. It steered straight and steady. A perfect clean run. I pulled off the track near the six mile marker after slowly slowly rolling off the throttle. It’s a long, quiet wait out there until your crew arrives to hitch the bike and get you back to the pits. You are looking at their faces when they approach, do they know the speed? Why aren’t they whooping and hollering with big smiles? No speed has come through yet. We load up and head back toward the pits which is just a black spec in the distance. And then it comes through, “Bike 234, 1950 Vincent, 184?? mph congratulations!” So after years of building, modifying, chopping and changing the bike and the hundreds of hours spent in the shed working on it, it was all worth it. Very happy racers !!!! After everything had calmed down (which took quite a while) we decided to run again the following morning with 2 teeth less on the rear sprocket (36), nothing to lose trying it. We had a sprinkle of rain through the night and there were crosswinds across the track the next morning. We had coffee and bacon and egg wraps and waited. The wind finally swung about 10:30am and after some track delays we were again blasting down the track after 11.00am. We had probably missed the best air. 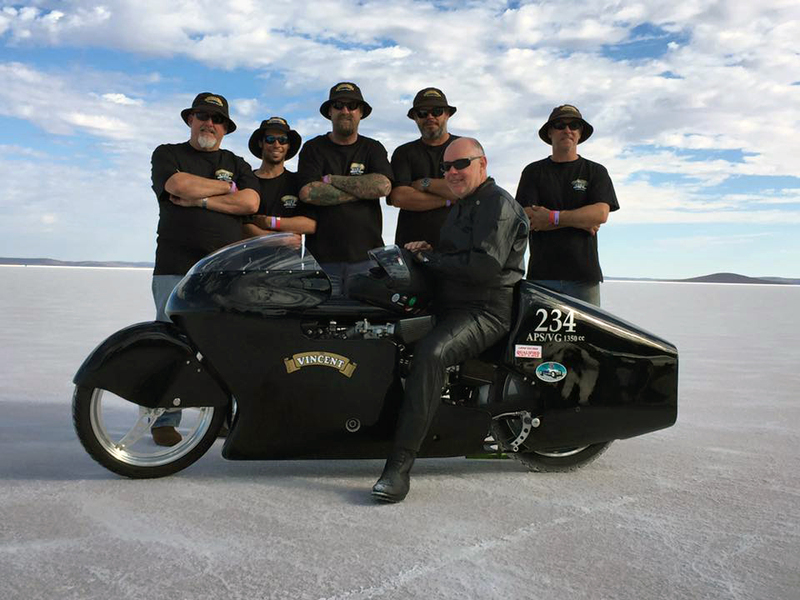 The bike would only rev to 6500 but it was good enough to achieve a speed of 185.34 mph, just above our late friend Russel Wright’s record of 185.15 mph. It would be interesting to know if anyone has run above our speed on gas (petrol) before? Maybe someone on the forum would know? It has been a great week of racing for us. Also great to be pitted with Stu Penn on his supercharged methanol Vincent. What a beautiful noise… and an amazing machine. Stu had clutch problems this year but he will be back. Just great to see that bike being used. 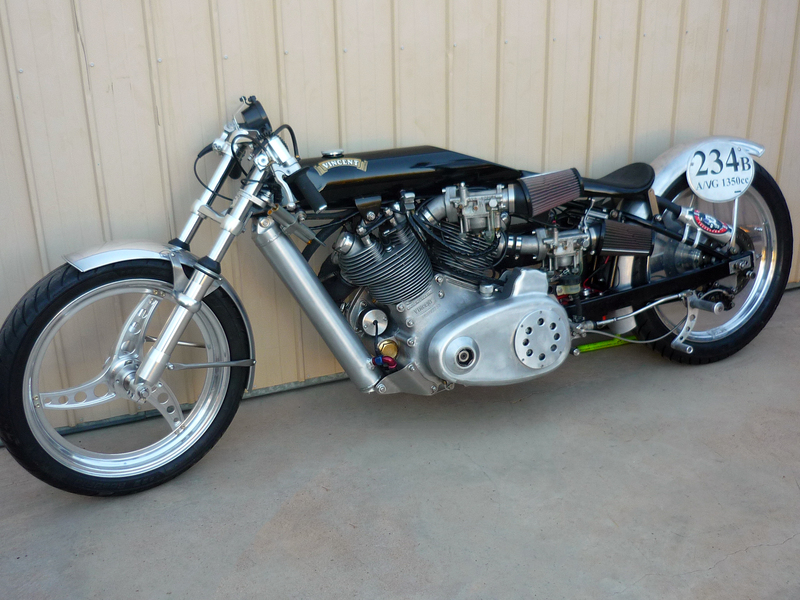 What I find most interesting is the fact that a normally aspirated Vincent twin running on gas came within 8 mph of the Velocette single which was both [ heavily ] supercharged as well as running on nitro . Regarding Vincent vs Velo at the Lake; The Vincent, running in the 1350 class, was presumably twice the engine capacity of the Velocette. Both were partially streamlined, in very similar profiles. A supercharger running at 14lbs of boost might add 80-100% to the power of the Velo engine, and the nitro, depending on the mix, might add another 40%. Getting an extra 8mph out of a motorcycle at those speeds requires an exponential increase in horsepower, and the results looks consistent with the above – the Velo made 20-40% more power than the Vincent at a guess, with the final speed dependent on factors like drag, transmission losses, traction, etc. First Mr D’Orleans your numbers are incorrect . By the rules of ICE physics supercharging at 10 lbs or higher at least doubles the functional capacity of an ICE making the Velocette by supercharging alone at least the equal to the Vincent so at 14 lbs it is greater . Then add on at LEAST an additional 40% [ once again according to the science and the amount of nitro used ] and you have a distinct advantage well beyond a naturally aspirated ICE running on gas versus nitro . Secondly the aerodynamic ‘ wall’ comes at approximately 202.35 mph not below . Third Mr D’Orleans is that you have a very distinct and public bias towards Velocette so anything you may say in its defense is negated by your overwhelming [ because you own one and are a fan/true believer ] and blatant bias towards Velocette and against Vincent [ your other blatant bias being Brough ] Fourth . As the song says Mr D’Orleans … there’s nothing like a Vincent . Of any vintage or model . Fifth is the Velocette is running in a virtually uncontested class [ Vintage Single streamliner SC Nitro ] who’s rules are to say the least less than formal at this point in time .. making any so called ‘ records ‘ the Velocette may of attained all but irrelevant . Science , engineering and the facts good sir . Not overly romantic biased infused , opinionated rhetoric . Mr Leshinsky, you seem to have a bias against rational discussion. There is an obvious performance gap between a 193mph 650cc pushrod single, and a 185mph 1350cc v-twin: that was the crux of my comment.